I have such mixed feelings about the change of seasons from summer to fall…on one hand, I *love* all-things-fall and can’t wait for crisp clear autumn days, sweaters with leggings and boots, football games, fall festivals, and pumpkin spice flavored everything! On the other hand, it’s sad to say goodbye to the warm sun, cook-outs, evenings on the deck and lazy summer days. 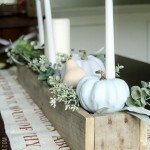 I think for that reason, my transition from summer to fall decor is a very gradual one. 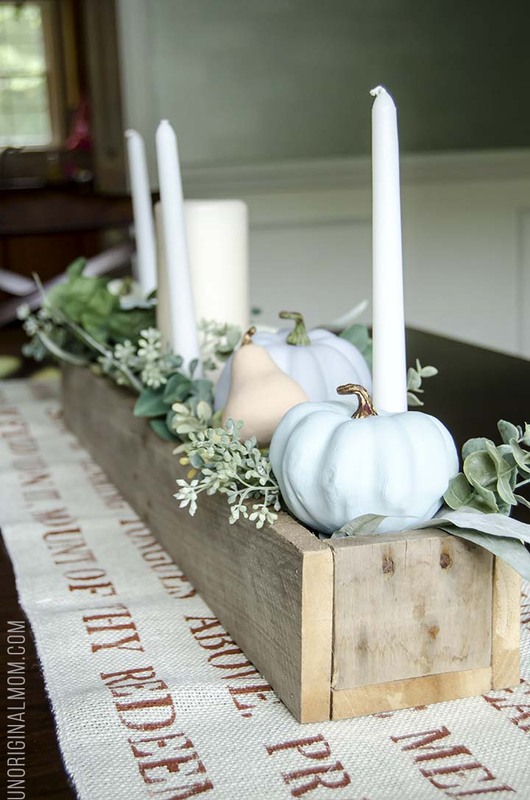 Partly because I don’t do much “summer decorating” in the first place, and also because I find myself layering more and more fall decor in my home all the way up until Thanksgiving. I like to begin in September with lots of neutral colored elements and add more traditional fall colors in October and November. 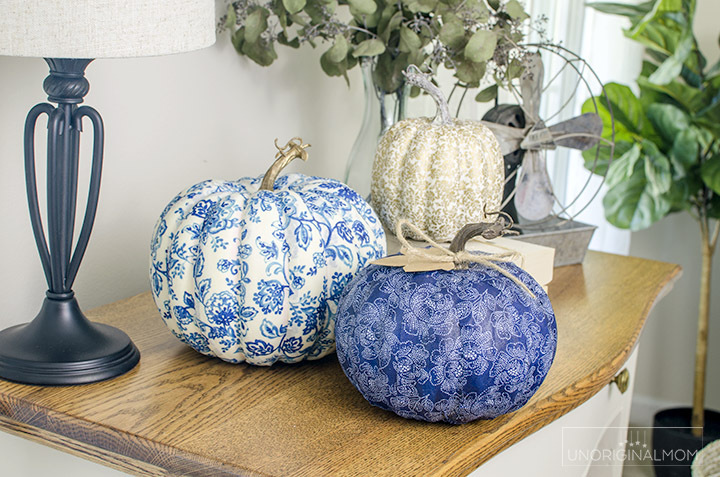 All that to say, I think these DIY Fabric Covered Pumpkins are a perfect way to let fall just begin to creep into your home – they’re subtle and tasteful but they definitely qualify as fall decor! I headed to my local JoAnn’s to browse the fabric selection and pick up some faux pumpkins. Since it’s still August, I decided to go the opposite direction from the typical browns, oranges, and reds of fall and try something a little different – blue! Isn’t this fabric just to die for? SO pretty! I threw the gold in there for a little accent but ending up loving that just as much as the blue, too. I started by cutting strips by hand, but that was taking too long…so I cut 1.5-2″ strips (depending on the size of the pumpkin) using my rotary cutter. The length will depend on the size of the pumpkin, too. 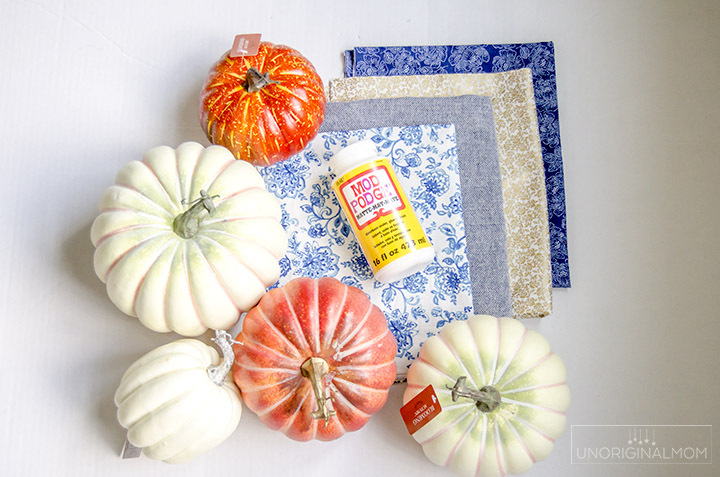 I bought a half yard of each kind of fabric and ended up not using more than 1/4 yard of any of them, but again – it totally depends on the size of the pumpkin and how many you’re covering. After I had a big pile of strips cut, I used fabric scissors to cut points at both ends – that helps the fabric lay better on the top and bottom of the pumpkin. 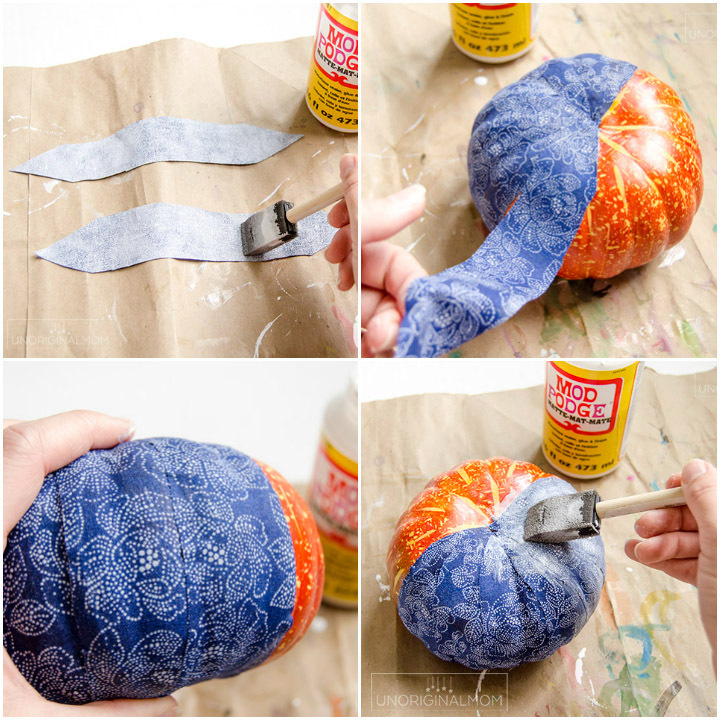 To apply the fabric strips to the pumpkin, paint the back side of the fabric generously with Mod Podge and then smooth them onto the pumpkin, top to bottom. It helps if you stretch the fabric a little bit and then use your fingers to smooth out the wrinkles. (It’s okay if you end up with some wrinkles on the bottom.) Continue to apply each strip, overlapping them slightly. Then, either immediately after applying each strip or at the end after you’ve applied them all, coat the top of the fabric with more Mod Podge. 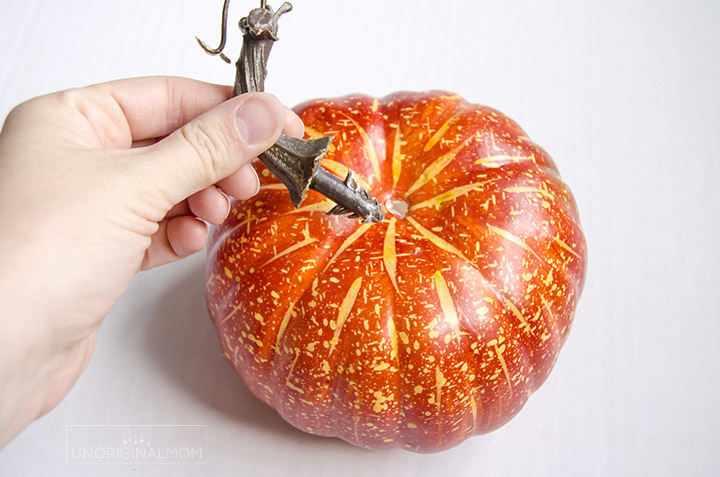 Let it dry, reattach the stem (I poked a hole for the stem in the middle of the pumpkin with a pencil first), and add some embellishments, if you want – I used a brown paper leaf and some twine. 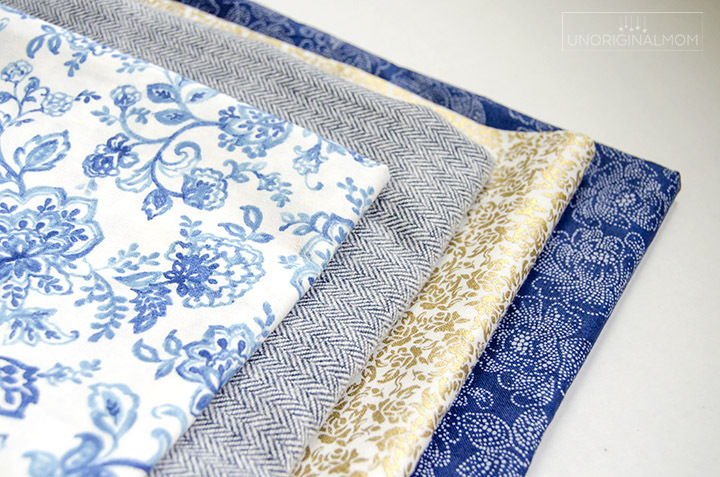 Then, make a few more with some different fabric! I found that medium-light weight fabric without geometric patterns works best. If I’d tried this with a plaid fabric, or something like that, it would be very easy to see each individual strip of fabric. (I ended up not even trying the herringbone fabric that I got, because it was a little heavier weight and I didn’t think it would lay very well.) But with the fabric I used, once you take a step back you can’t even tell that it’s made out of fabric strips! They go perfectly in my piano room with that blue map, don’t you think? 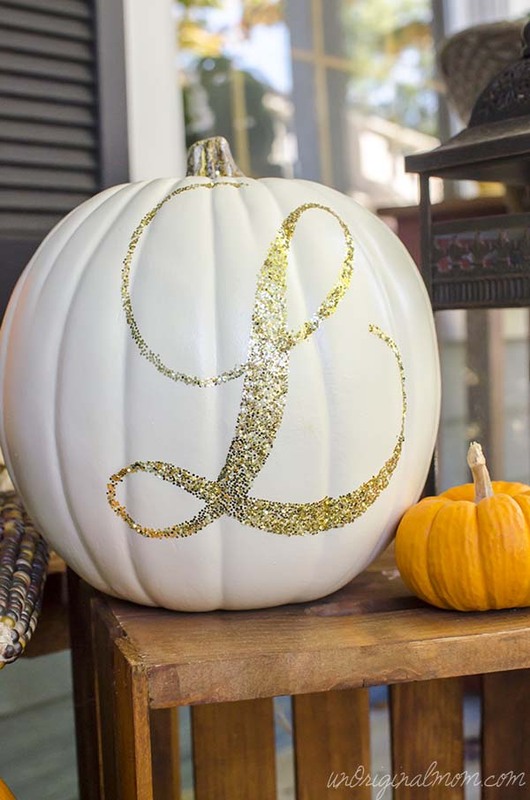 Just a little subtle suggestion of fall. 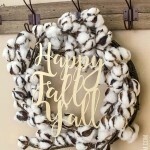 Another thought about fall – it makes me want to do more crafting! Whether it’s the kids going off to school, or just the fact that there’s so many fun crafting possibilities in fall, I always get bit – hard! – by the “crafting bug” in September! That’s why I was really excited to try out the new JOANN mobile app! Not only is it an easy way to make sure you always have your coupons with you (yay for mobile coupons!) but you can browse “how to” videos that include step-by-step project instructions, a list of supplies, difficulty level, and time needed. You can save your favorite projects and come back to them later, too. Helloooooo, crafty inspiration overload! 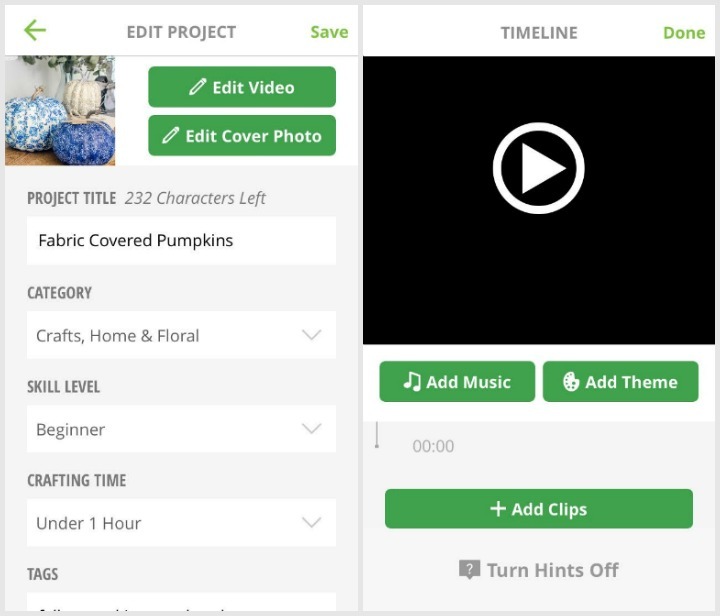 But that’s not all – if you have an especially great project that you want to share with the world, you can use the JOANN app to create a video! How cool is that? Using either video clips or photos, you can put together a professional looking how-to video in no time at all. You can even add effects and music within the app – so cool! 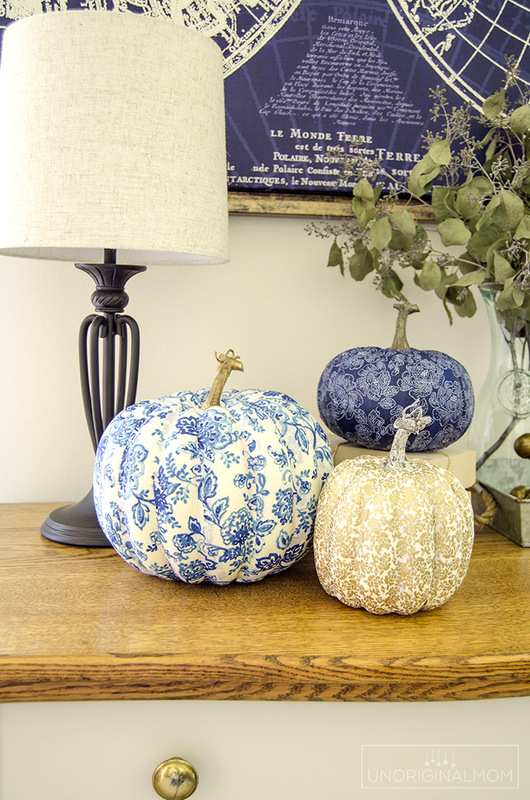 I added this DIY Fabric Covered Pumpkins project to the JOANN app…want to see how my video turned out? Here it is! 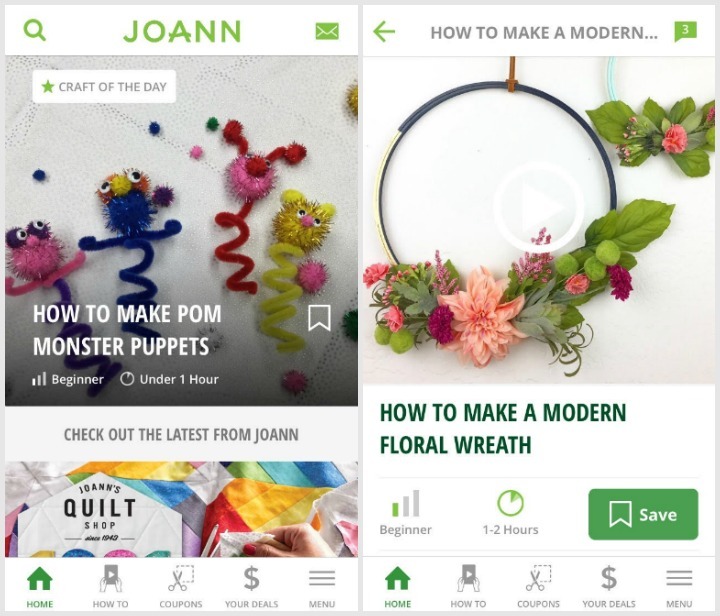 I hope you’ll check out all the fun and inspiring features in the new JOANN app as you’re making your fall “to-craft” list. Here are links to download the iOS version and the Android version. Let me know if you make a video – I want to see it! 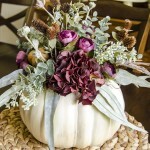 …or these chalk-painted pumpkins I made into a simple and beautiful fall centerpiece. 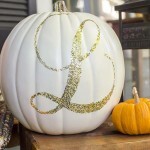 LOVE these pumpkins! 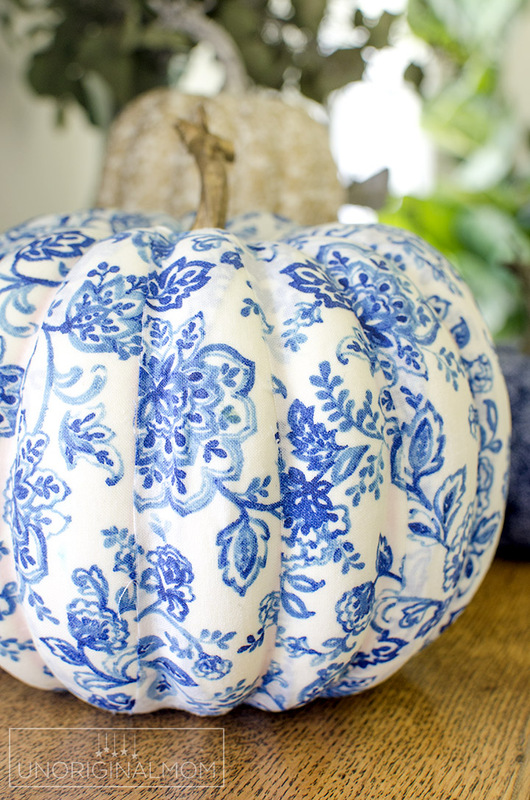 Can you give us a general idea of how much fabric you used and what size your pumpkin was? Thanks so much! Thanks Camille! 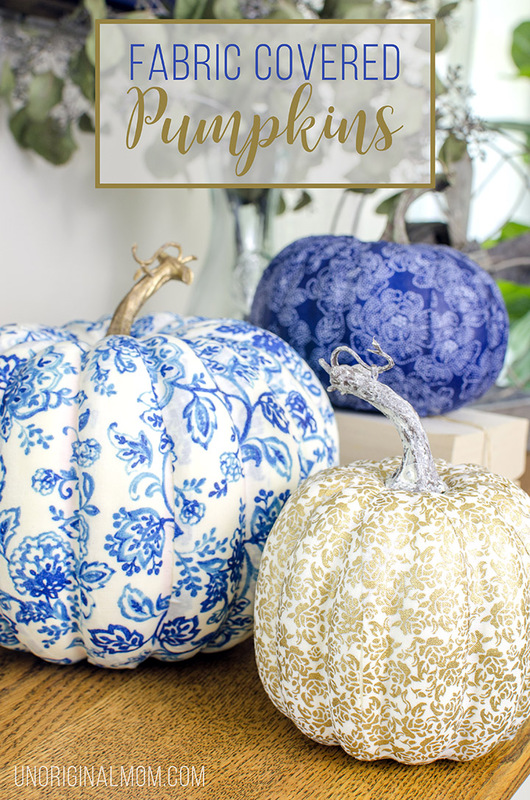 I bought 1/2 yard of each of the fabrics and that was more than enough…I probably used about 1/4 yard on the largest pumpkin (the white with blue flowers), and that one is close to 9 inches tall. Hope that helps! I absolutely love ❤️ the fabrics you picked. 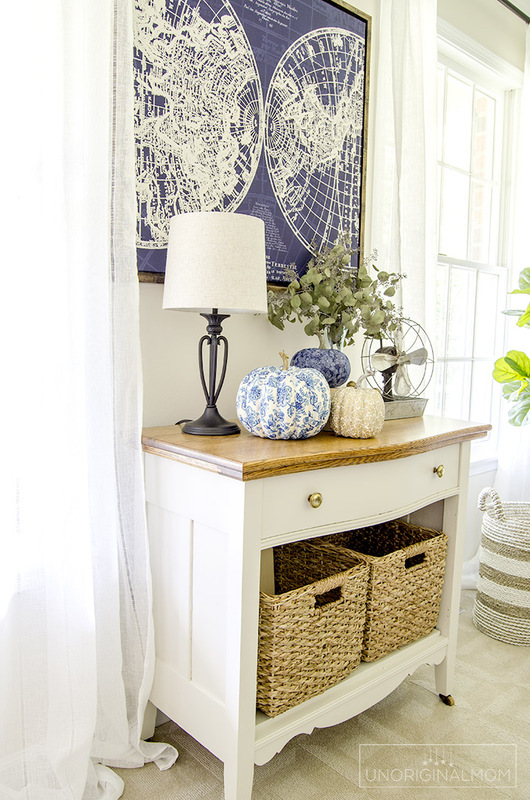 Blue and white is one of my favorite color combinations. I also enjoyed using the new Joann’s app. this weekend. Having your coupons on your phone is a great convenience, I would often leave my paper coupons at home. Thank you for sharing your talent with us. I loved this! We just happened to see this after we saw fabric pumpkins in a store. My daughter asked so politely if she could have one. I saw the price tag and my jaw dropped. I told her that we would have more fun choosing our fabrics and making our own. We made one for less than $2 from a dollar tree pumpkin and a Halloween themed fat quarter that she picked out. We still have half the fabric left for another for Grandma’s house. Thank you so much for sharing this. Oh, wonderful, I’m so happy to hear that! It’s so fun to be able to customize these however you’d like. I’m glad you enjoyed it, thanks for sharing!! I am excited to try this. Do you think it would help the fabric form to the pumpkin shape if I cut the strips on the bias? Hi Marlene, yes it probably would help a bit! Though I didn’t have much trouble so it’s not completely necessary. I have wrinkles and I can’t get out what am I doing wrong? Hi Frankie, I had to work at each strip and stretch it a little and press down the sides to work out all the wrinkles, and sometimes I had to add some more mod podge. I found that narrower strips worked better, too. You’ll definitely have some wrinkles and folds on the bottom of the pumpkin, which will never be seen, but you should be able to work *most* of them out around the sides. I did end up with a few wrinkles on mine but they’re barely noticeable at all. Your pumpkins look beautiful and you made it look so easy. I thought it was actually a pretty tough project. I had a lot of trouble getting the wrinkles out. My pumpkin looks very bumpy. I think a kindergartener’s art project would look better than mine. I’m sorry it didn’t work out for you Laura! I did find that the wider my strips were, the harder it was to get them smooth…so maybe try narrower strips? Or maybe it was the kind of fabric? I imagine thicker fabric would be trickier to work with, I used a thin cotton on mine. I also took time on each strip to stretch it and smooth it with my thumbs, adding more mod podge underneath and over top of the strips as I went. As long as I went slowly, I didn’t find it to be that difficult. My pumpkins do have a few wrinkles but as you can see from the photos, once you are more than a foot away from them they aren’t noticeable at all. Love this! 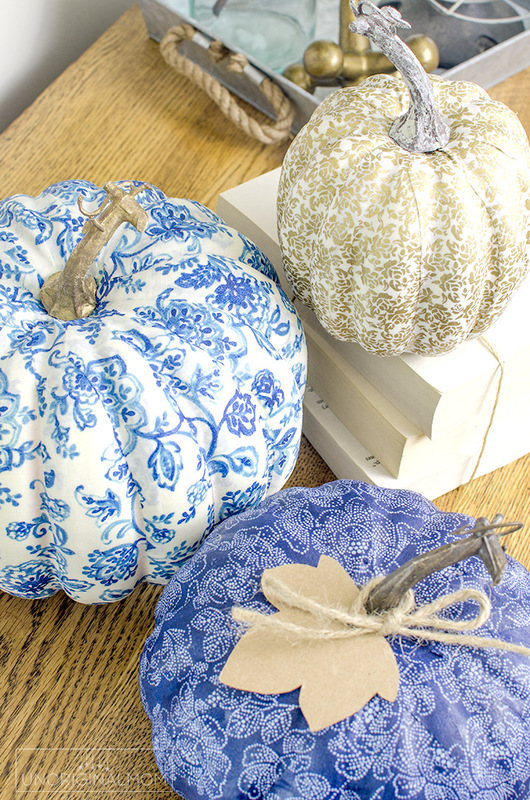 Would paper napkins (printed) be too thin to decoupage on the pumpkins ? You could totally use napkins! I’ve seen people use scrapbook paper and it works well. Of course, without the stretch of the fabric you’ll likely end up with more wrinkles but they’re not that noticeable from even a small distance. Cute project! Where did you get the leaf from? I just cut one myself out of brown card stock! Nothing fancy. Our ladies church group is making this tomorrow! These are beautiful! What a wonderful idea!